This dish might not look pretty to photograph but I found it delicious. I made it the week after I returned from my Portland trip. During the trip, we participated in a food tasting that lasted about 4 hours (including walking time, but still), it was a lot. Although I enjoyed every sip of my lattes, every morsel of chocolate and every lick of ice cream, I was ready for some lighter food the following week. The original recipe was actually a soup, but I wanted something thicker that I can eat on top of steaming hot rice or spaghetti squash. So I adapted the recipe and the result turned out great. 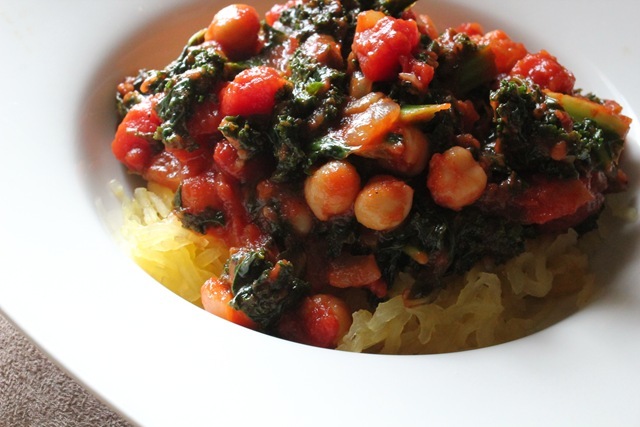 The protein from this dish comes from the garbanzo beans and I loved that it incorporate kale. 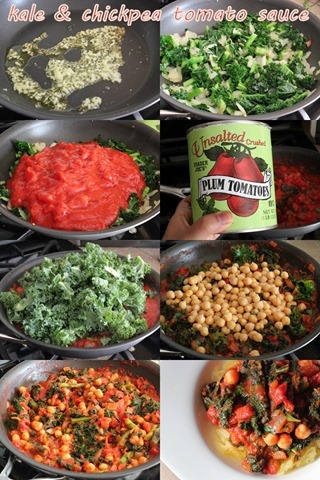 I always try to incorporate kale in my veggie intake, and this would be a good dish for it. This was also baby food friendly. I always introduce my little guy to the foods we are eating, I just put it on his tray during meal times and see if he will pick it up. I just chopped up all the pieces and he ate it all. I also add a little butter to his spaghetti squash. Heat a saute pan over low to medium heat. Add oil and then garlic to heated oil. Once you can smell the garlic, add in onions and kale stems with a pinch of salt. Saute until softened, about 5 minutes. Add in crushed tomatoes and paprika. Simmer for another 3 minutes and then add in kale leaves, as much as can fit into the pan. Add more as room is made. Toss in chickpeas and then simmer for additional 6 minutes. Season to taste with salt and pepper. Add lemon juice if desired. 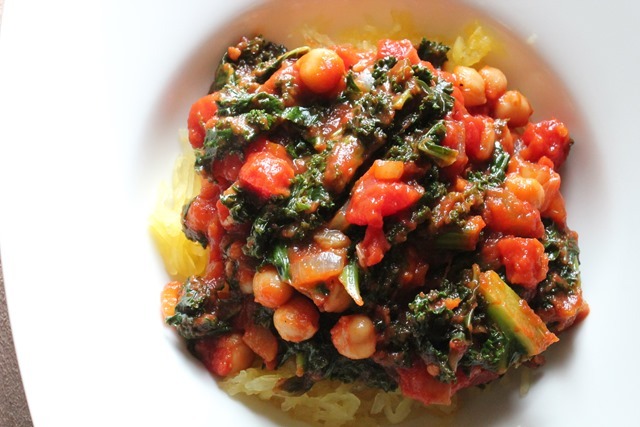 ***** I ate this sauce with spaghetti squash or served on brown rice. Looks totally amazing!!!! Great combination of lots of healthy veggies and protein! Sounds like little man is doing awesome with food. Kay liked spaghetti squash when she was a peanut, but I think the texture throws her now and she won’t eat it!